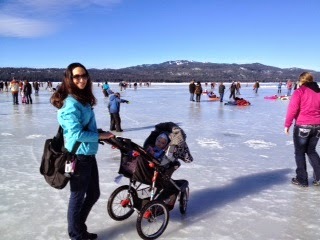 Have you guys ever been up to McCall, Idaho during Winter Carnival? It's crazy! This small town of 3,000 people gets bombarded with thousands of people! I've been to the Winter Carnival with my family once or twice as a little kid. But I don't remember it at all and I've just seen pictures. 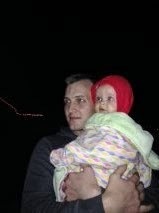 To kick off the Carnival, there is a big fireworks show over the lake. We could see them from our front yard, so we bundled up and watched them for a bit. 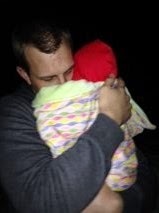 Kess wasn't so sure if she liked the fireworks or not, so she got a little nervous and cuddled up on daddy. We have been watching the sculptures come to life over the past few weeks, so it was fun to walk around and see them finished. We coordinated between Kess' nap times and decided to bundle up and head out for part of the afternoon. Our first stop was at the hospital that Matt works at. 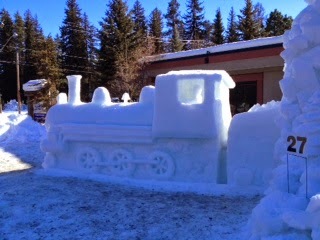 They got Honorable Mention for their sculpture of a train going through the arch near Smith’s Ferry, Idaho. We then headed downtown. The lake has been froze over for a few weeks now and I've been dying to walk on it and it's something that I've never done before, so I had to do it! 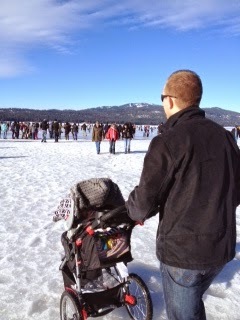 We marched through the snow down to the beach - stroller and all. I'm sure we were quite the sight and such a gorgeous day! 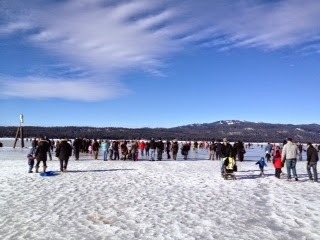 There were tons of people out in the middle of Payette Lake. I wasn't that brave, so we stayed close-ish to shore. After being pushed and shoved all around our tiny little town, we decided to head back and enjoy the rest of our evening at home. The carnival is still going through this weekend, so if you haven’t experienced it you should give it a try. Matt and I are hoping to grab some vendor food before it's over, which I’m a total sucker for! Don't judge me, I'm still breastfeeding and need the calories ;) right? Side note: We are currently living in McCall, Idaho temporarily for Matt's job. We are originally from the Treasure Valley! 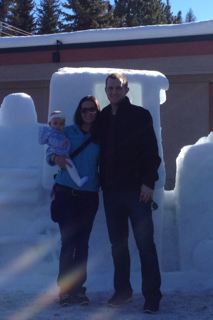 So we are trying to soak up the little town of McCall while we can!